Take me in and make me Thine own. From that day till the end of his earthly sojourn, Venkataraman made Arunachala (Tiruvannamalai) his abode, transmitting through Mouna, the golden language of his egoless state, the Message of Eternal Truth, to the four corners of the globe. Venkataraman left a note behind to his rebuking brother: "I have, in search of my Father, according to His command, started from this place. On a virtuous enterprise, indeed, I have this day embarked. Therefore, for this action none need grieve or trace this one. No money need be spent for searching me". "It was about six weeks before I left Madurai for good, in the middle of the year 1896, that the great change in my life took place" said Sri Ramana Maharshi, when asked by devotees as to how he was transformed, "It was so sudden. One day I sat up alone on the first floor of my uncle’s house. I was in my usual good health. But a sudden and unmistakable fear of death seized me. I felt I was going to die and at once set about thinking as to what I should do. I did not care to consult anyone, be he a doctor, elder or friend. I felt I had to solve the problem myself then and there. The shock of the fear of death made me at once introspective or ‘introverted’. I said to myself mentally, ‘Now that death is come, what does it mean? Who is it that is dying? This body dies’. I at once dramatised the situation. I extended my limbs and held them rigid as though rigor mortis had set in. I imitated a corpse to lend an air of reality to my further investigation. I held my breath and kept my mouth closed, pressing the lips tightly together, so that no sound could escape. ‘Well then’ I said to myself, ‘this body is dead. It will be carried to the crematory and there burnt and reduced to ashes. But with the death of my body, am I dead? Is the body I? This body is silent and inert. But I am still aware of the full force of my personality and even of the sound of I within myself as apart from the body. The material body dies, but the Spirit transcending it cannot be touched by death. I am therefore the deathless Spirit’. All this was not a feat of intellectual gymnastics, but came as a flash before me vividly as living Truth, which I perceived immediately, without any argument almost. I was something very real, the only real thing in that state, and all the conscious activity that was connected with my body was centred on that. The I or myself was holding the focus of attention with a powerful fascination. Fear of death vanished at once and for ever. The absorption in the Self has continued from that moment right up to now". Ramana practised Tapas in the thousand-pillared Mandapam, near the Patala Linga, in Subrahmanya’s shrine, in the Mango garden, the Sadguru Swami cave and Cora hills. From 1909 to 1916 he lived in the Virupakshi Cave. During his days of Tapas, mischievous boys pelted him with stones and hurled tiles at him; and yet Ramana was ever peaceful and calm through the strength of meditation and penance. 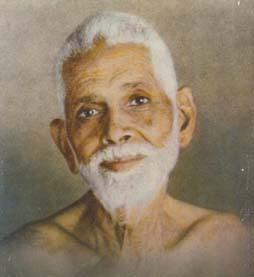 Ramana Maharshi was known as Brahmana Swami in Tiruvannamalai. Kavya Kanta Ganapathy Sastri, the great Sanskrit scholar, came to Ramana’s Ashram in 1908 and stayed with Maharshi and wrote the Ramana Gita. The life of the Maharshi was one continued meditation, Ananda Anubhavam. Maharshi established peace within. He lived in the Light of the Lord within. He encouraged others to do the same thing. To him all the world was one. Maharshi seldom talked, and whenever he did speak, he did so only because it was absolutely necessary. Ramana was a living example of the teaching of the Upanishads. His life was at once the message and the philosophy of his teachings. He spoke to the hearts of men. The great Maharshi found Himself within himself and then gave out to the world the grand but simple message of his great life, "Know Thyself". "Know Thyself. All else will be known to thee of its own accord. Discriminate between the undying, unchanging, all-pervading, infinite Atma and the ever-changing, phenomenal and perishable universe and body. Enquire, ‘Who am I?’ Make the mind calm. Free yourself from all thoughts other than the simple thought of the Self or Atma. Dive deep into the chambers of your heart. Find out the real, infinite ‘I’. Rest there peacefully for ever and become identical with the Supreme Self." This is the gist of the philosophy and teachings of Sri Ramana Maharshi. Sri Ramana says, "The world is so unhappy because it is ignorant of the true Self. Man’s real nature is happiness. Happiness is inborn in the true Self. Man’s search for happiness is an unconscious search for his true Self. The true Self is imperishable; therefore, when a man finds it, he finds a happiness which does not come to an end. "In the interior cavity of the heart, the One Supreme Being is ever glowing with the Self-conscious emanation I...I... To realise Him, enter into the heart with an one-pointed mind—by quest within or diving deep or control of breath—and abide with the Self of self". Sri Ramana’s Who am I?, Upadesa Saram and Ullathu Narpathu are pearls of direct wisdom, expressed in aphoristic terseness. Sri B.V. Narasimha Swami, the late President of the All India Sai Samaj, has published a thrilling life of Ramana entitled, "Self-realisation". Yogi Suddhananda Bharati has written the life of Sri Ramana in Tamil. Bhagavan Ramana Maharshi has set at naught the prattle of materialists that Self-realisation and Samadhi are things of the remote past, and that in the present age, they are impossible of achievement to man. He has shown by his lifelong Samadhi that it is still possible to realise the Supreme and live in that realisation. Beloved aspirant! Take heart. Gird up your loins. Apply yourself intensely to Yoga Sadhana. You will soon attain Videha Kaivalya and shine for ever as an illumined sage. Lieut-Col. P.V. Karamchandani, I.M.S., D.M.O., North Arcot District, attended on Sri Ramana when the latter suffered from a kind of malignant tumour in his upper left arm above the elbow. The Maharshi was operated four times. A meteor hit the sky at 8-47 p.m. on the 14th April, 1950, when Sri Ramana Maharshi left his mortal coil and entered Mahasamadhi. The all-pervading Light which shone through the embodiment of that Light in Maharshi Ramana had once again resolved itself into its original state. A lifelong proof of the Upanishads was what we called Maharshi Ramana. That proof will for ever exist, reassuring us of the Ultimate Reality. The saint is no more in his mortal frame. But the Light of his soul is now merged in every receptive individual soul. Maharshi Ramana lives in our heart. His passing away should not be grieved for. For he had fulfilled the mission of his life. He had achieved the highest goal, Self-realisation. So there is nothing to grieve for. The death of only those that are not able to achieve the goal of life or do their duty has any reason to be mourned. The Light of the Maharshi’s soul shines today brighter than ever. In the heart of humanity the saint shall live for ever, guiding, encouraging, goading and inspiring, so that millions and millions might seek and find the Great Truth that Ramana realised. Too well did Sri Ramana expound the Vedanta philosophy, not through bookish knowledge, but by practical experience. His teachings imparted through all-absorbing ‘Silence’ embodied the highest ideals and the ultimate reaches in divine realisation. To ever assert one’s latent divinity, to ever strive to live in the consciousness of the immortal Self and to remain as an unaffected witness of the transitory phases of life immersed in that Supreme Silence—was the clarion call of the Maharshi. Dogmas and religious prejudices he cared not for! For he was far above those mundane limitations. With him lived orthodox Brahmin priests, Moslems and Christians and the so-called Indian untouchables. They were all alike to him. As an architect-supreme of Truth-transcendental, Ramana Maharshi led, and now leads on, the weary travellers on earth towards the Goal through his unfathomable Silence. To pay the most befitting homage to that saintly personality is to follow his teachings and to grow up in that ideal model.